^ Arblaster, J. W. Densities of osmium and iridium: recalculations based upon a review of the latest crystallographic data (PDF). Platinum Metals Review. 1989, 33 (1): 14–16. 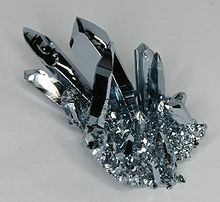 ^ Arblaster, J. W. Osmium, the Densest Metal Known. Platinum Metals Review. 1995, 39 (4): 164. ^ Weinberger, Michelle; Tolbert, Sarah; Kavner, Abby. Osmium Metal Studied under High Pressure and Nonhydrostatic Stress. Phys. Rev. Lett. 2008, 100 (4): 045506. Bibcode:2008PhRvL.100d5506W. PMID 18352299. doi:10.1103/PhysRevLett.100.045506. ^ Selig, H.; Claassen, H. H.; Chernick, C. L.; Malm, J. G.; Huston, J. L. Xenon tetroxide – Preparation + Some Properties. Science. 1964, 143 (3612): 1322–3. Bibcode:1964Sci...143.1322S. JSTOR 1713238. PMID 17799234. doi:10.1126/science.143.3612.1322. ^ Huston, J. L.; Studier, M. H.; Sloth, E. N. Xenon tetroxide – Mass Spectrum. Science. 1964, 143 (3611): 1162–3. Bibcode:1964Sci...143.1161H. JSTOR 1712675. PMID 17833897. doi:10.1126/science.143.3611.1161-a. ^ Barnard, C. F. J. Oxidation States of Ruthenium and Osmium. Platinum Metals Review. 2004, 48 (4): 157. doi:10.1595/147106704X10801. ^ Gong, Yu; Zhou, Mingfei; Kaupp, Martin; Riedel, Sebastian. Formation and Characterization of the Iridium Tetroxide Molecule with Iridium in the Oxidation State +VIII. Angewandte Chemie International Edition. 2009, 48 (42): 7879. doi:10.1002/anie.200902733. ^ Domanov, V. P.; Lobanov, Yu. V. Refinement of data on the volatility of octavalent plutonium in the form of tetraoxide PuO4. Radiochemistry (SP MAIK Nauka/Interperiodica). February 2009, 51 (1): 14–17. doi:10.1134/S1066362209010044. ^ Domanov, V. P. Possibility of generation of octavalent curium in the gas phase in the form of volatile tetraoxide CmO4. Radiochemistry (SP MAIK Nauka/Interperiodica). January 2013, 55 (1): 46–51. doi:10.1134/S1066362213010098. ^ Krause, J.; Siriwardane, Upali; Salupo, Terese A.; Wermer, Joseph R.; Knoeppel, David W.; Shore, Sheldon G. Preparation of [Os3(CO)11]2− and its reactions with Os3(CO)12; structures of [Et4N] [HOs3(CO)11] and H2OsS4(CO). Journal of Organometallic Chemistry. 1993, 454: 263–271. doi:10.1016/0022-328X(93)83250-Y. ^ 18.0 18.1 Mager Stellman, J. Osmium. Encyclopaedia of Occupational Health and Safety. International Labour Organization. 1998: 63.34. ISBN 978-92-2-109816-4. OCLC 35279504 45066560. ^ 20.0 20.1 Griffith, W. P. Osmium and its compounds. Quarterly Review of the Chemical Society. 1965, 19 (3): 254–273. doi:10.1039/QR9651900254. ^ Subcommittee on Platinum-Group Metals, Committee on Medical and Biologic Effects of Environmental Pollutants, Division of Medical Sciences, Assembly of Life Sciences, National Research Council. Platinum-group metals. National Academy of Sciences. 1977: 55. ISBN 0-309-02640-7. ^ Gulliver, D. J; Levason, W. The chemistry of ruthenium, osmium, rhodium, iridium, palladium and platinum in the higher oxidation states. Coordination Chemistry Reviews. 1982, 46: 1–127. doi:10.1016/0010-8545(82)85001-7. ^ Peter A. Lay; W. Dean Harman. Advances in Inorganic Chemistry. A. G. Sykes. Academic Press. 1992: 221. ISBN 0-12-023637-0. ^ Alvarez, L. W.; Alvarez, W.; Asaro, F.; Michel, H. V. Extraterrestrial cause for the Cretaceous–Tertiary extinction. Science. 1980, 208 (4448): 1095–1108. Bibcode:1980Sci...208.1095A. PMID 17783054. doi:10.1126/science.208.4448.1095. ^ Venetskii, S. I. Osmium. Metallurgist. 1974, 18 (2): 155–157. doi:10.1007/BF01132596. ^ McDonald, M. The Platinum of New Granada: Mining and Metallurgy in the Spanish Colonial Empire. Platinum Metals Review. 959, 3 (4): 140–145. ^ Juan, J.; de Ulloa, A. Relación histórica del viage a la América Meridional 1. 1748: 606 （西班牙语）. ^ 32.0 32.1 32.2 32.3 32.4 Hunt, L. B. A History of Iridium (PDF). Platinum Metals Review. 1987, 31 (1): 32–41 [2012-03-15]. ^ 33.0 33.1 33.2 Emsley, J. Osmium. Nature's Building Blocks: An A-Z Guide to the Elements. Oxford, England, UK: Oxford University Press. 2003: 199–201. ISBN 0-19-850340-7. ^ 34.0 34.1 34.2 Griffith, W. P. Bicentenary of Four Platinum Group Metals. Part II: Osmium and iridium – events surrounding their discoveries. Platinum Metals Review. 2004, 48 (4): 182–189. doi:10.1595/147106704X4844. ^ Thomson, T. A System of Chemistry of Inorganic Bodies. Baldwin & Cradock, London; and William Blackwood, Edinburgh. 1831: 693. ^ Weeks, M. E. Discovery of the Elements 7. Journal of Chemical Education. 1968: 414–418. ISBN 0-8486-8579-2. OCLC 23991202. 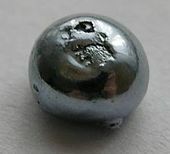 ^ Tennant, S. On Two Metals, Found in the Black Powder Remaining after the Solution of Platina. Philosophical Transactions of the Royal Society. 1804, 94: 411–418. JSTOR 107152. doi:10.1098/rstl.1804.0018. ^ Smil, Vaclav. Enriching the Earth: Fritz Haber, Carl Bosch, and the Transformation of World Food Production. MIT Press. 2004: 80–86. ISBN 978-0-262-69313-4. ^ 39.0 39.1 George, Micheal W. 2006 Minerals Yearbook: Platinum-Group Metals (PDF). United States Geological Survey USGS. [2008-09-16]. ^ Wedepohl, Hans K. The composition of the continental crust. Geochimica et Cosmochimica Acta. 1995, 59 (7): 1217–1232. Bibcode:1995GeCoA..59.1217W. doi:10.1016/0016-7037(95)00038-2. ^ Commodity Report: Platinum-Group Metals (PDF). United States Geological Survey USGS. [2008-09-16]. ^ George, M. W. Platinum-group metals (PDF). U.S. Geological Survey Mineral Commodity Summaries (USGS Mineral Resources Program). 2008. ^ George, M. W. 2006 Minerals Yearbook: Platinum-Group Metals (PDF). United States Geological Survey USGS. [2008-09-16]. ^ Renner, H.; Schlamp, G.; Kleinwächter, I.; Drost, E.; Lüschow, H. M.; Tews, P.; Panster, P.; Diehl, M.; Lang, J.; Kreuzer, T.; Knödler, A.; Starz, K. A.; Dermann, K.; Rothaut, J.; Drieselman, R. Platinum group metals and compounds. Ullmann's Encyclopedia of Industrial Chemistry. Wiley. 2002. doi:10.1002/14356007.a21_075. ^ Gilchrist, Raleigh. The Platinum Metals. Chemical Reviews. 1943, 32 (3): 277–372. doi:10.1021/cr60103a002. ^ PLATINUM-GROUP METALS (PDF). USGS. [27 May 2013]. ^ MacDonell, Herbert L. The Use of Hydrogen Fluoride in the Development of Latent Fingerprints Found on Glass Surfaces. The Journal of Criminal Law, Criminology, and Police Science. 1960, 51 (4): 465–470. JSTOR 1140672. doi:10.2307/1140672. ^ Chadwick, D. Role of the sarcoplasmic reticulum in smooth muscle. John Wiley and Sons. 2002: 259–264. ISBN 0-470-84479-5. ^ Colacot, T. J. 2001 Nobel Prize in Chemistry (PDF). Platinum Metals Review. 2002, 46 (2): 82–83. ^ Osmium tetroxide as a reagent in organic chemistry — Master Organic Chemistry. Masterorganicchemistry.com. Retrieved on 2012-12-07. ^ Torr, Marsha R. Osmium coated diffraction grating in the Space Shuttle environment: performance. Applied Optics. 1985, 24 (18): 2959. Bibcode:1985ApOpt..24.2959T. PMID 18223987. doi:10.1364/AO.24.002959. ^ Gull, T. R.; Herzig, H; Osantowski, JF; Toft, AR. Low earth orbit environmental effects on osmium and related optical thin-film coatings. Applied Optics. 1985, 24 (16): 2660. Bibcode:1985ApOpt..24.2660G. PMID 18223936. doi:10.1364/AO.24.002660. ^ Fu, Ying; Romero, María J.; Habtemariam, Abraha; 等. The contrasting chemical reactivity of potent isoelectronic iminopyridine and azopyridine osmium(II) arene anticancer complexes. Chemical Science. 2012, 3 (8): 2485–2494. doi:10.1039/C2SC20220D. ^ Second LDEF post-retrieval symposium interim results of experiment A0034 (PDF). NASA. [2009-06-06]. ^ Linton, Roger C.; Kamenetzky, Rachel R.; Reynolds, John M.; Burris, Charles L. LDEF experiment A0034: Atomic oxygen stimulated outgassing. In NASA. Langley Research Center (NASA). 1992: 763. Bibcode:1992ldef.symp..763L. ^ How to Handle Osmium Tetroxide. University of California, San Diego. [2009-06-02]. （原始内容存档于2006-02-21）.